In the last few years, relations between India and Japan have attained a new level of understanding, friendship and strategic depth. This has helped in building a special strategic global partnership between the two countries that has not only strengthened the existing relations, but has also laid down the future road map of mutual cooperation. The present Japanese leadership has steered the Island nation, out of post second World War syndrome and Cold War politics, bringing in dedication and dynamism and specific direction towards creating a separate identity of its own. Japan was the first country outside India’s immediate neighbourhood that Mr. Narendra Modi visited after taking over as Prime Minister, which shows the importance India has given to strengthening India – Japan relations. Indian and Japanese core security interests and responsibilities are different and have their own strategic imperatives. However, both the nations have been able to grow a similar trajectory of merging their needs and aspirations. Japan has a mature economy, with an ageing population and low growth, while India is developing, young and growing. The favorable improvement in India-Japan relations which had begun as a mere rivulet in the 1990s grew into a stream from the year 2000 onward, and by around 2005 it had gained all the momentum of a major river. Building on the ethos of centuries old religions of Hinduism and Buddhism whose roots lay ingrained on the principles of humanity and brotherhood, the relations between the two nations have grown on the need to maintain economic balance while preserving the centuries old civilizational strains that the nations share. The exchange between Japan and India is said to have begun in the 6th century when Buddhism was introduced to the island nation. Indian culture, filtered through Buddhism, has had a great impact on Japanese culture, and this is the source of the Japanese people's sense of closeness to India. After World War II, in 1949, India’s first Prime Minister Jawaharlal Nehru donated an Indian elephant to the Ueno Zoo in Tokyo. This brought a ray of hope into the lives of the Japanese people who had still not recovered from defeat in the war. Japan and India signed a peace treaty and established diplomatic relations on 28th April, 1952. This treaty was one of the first peace treaties Japan signed after the World War II. Ever since the establishment of diplomatic relations, the two countries have enjoyed cordial relations. In the post World War II period, India's iron ore helped Japan a great deal to recover from the devastation. Following Japanese Prime Minister Nobusuke Kishi's visit to India in 1957, Japan started providing yen loans to India. In 1958 India got the first yen loan aid extended by Japanese government. Since 1986, Japan has become India's largest aid donor and remains so. The economic relations were certainly one of major factors in the India-Japan rapprochement, an even bigger factor was security policy to cope with growing threats in the region, creating a sense of unity within the Asian nations. Japan has been a valuable partner in India’s journey economic prosperity, infrastructure development, capacity building and technology advancement. significant dynamism and vigour in the last few years. It has become Japan’s most important military partner among Asian states that are not US allies. Indian Prime Minister Narendra Modi and his Japanese counterpart Shinzo Abe have been slowly pushing towards completing the purchase of defence equipments, which includes the sale of 12 US-2 aircrafts to India, to break Japan’s long-standing taboo against the export of military equipment. The recently concluded nuclear deal signals Tokyo’s willingness to share its state-of-the art atomic technology with a country that has not signed the Nuclear Non-proliferation Treaty. The civil nuclear deal inked on November 11th this year by India and Japan would have a significant bearing on the progress of the two atomic projects currently under discussion involving American nuclear vendors — GE-Hitachi and Toshiba-Westinghouse. The Agreement for Cooperation in Peaceful Uses of Nuclear Energy signed by the two sides is set to be a crucial determining factor as the two US-based reactor vendors, as well as a range of other global nuclear reactor manufacturers have alliances with Japanese companies and source the most critical equipment in a reactor — the Calandria or reactor vessel — from Japanese heavy forging major Japan Steel Works. Tokyo has come ahead to partner India’s flagship projects such as Digital India and Skill India, social and technical problems that Japan solved years ago. India and Japan will work together partnering the India-Pacific initiative to achieve stability and development of the region. Along with the intense interaction at strategic level, the co-operation in defence and economic sector is also a prominent and defining factor of any bilateral relationship in today’s world. In this context, maritime domain constitutes a core of evolving strategic ties between the two Asian powers with a largest potential of co-operation in the world. After achieving such assuring synergy in relations, in the light of exploring the scope for expansion of military ties both the countries are keen to achieve prominent control over the information at high seas and enhance discussions on future co-operation in defence equipment and technology. This makes the objective for bilateral exercises between Japan’s Maritime Self Defence Force and Indian Navy. The permanently designated trilteral nature of the naval exercise MALABAR from 2015 between India, United States and Japan also implies the change in India’s approach in view of the contemporary security calculus in the Indo-Pacific region. Japan earlier participated in Malabar exercise in the year 2007, 2009 and 2014. Along with the US Navy the MALABAR naval exercise gave mature depth to interoperability of Indian Navy with the Japanese Maritime Self Defence Force strengthening defence tie-ups between both the countries. Both the countries have supported and have been keen to develop a specialized 24-nation maritime construct enabling real-time sharing of data of all shipping – merchant and naval warships – operating in the Indian Ocean, parts of the Pacific Ocean and disputed waters of the East Vietnam Sea. These countries in this maritime setup would be from the Indian Ocean and also neighbours of China, some of whom have running territorial disputes with Beijing and are located east of the Malacca straits, a crucial shipping lane passing east of the Andaman Nicobar Islands. In light of the Sino-Japanese dispute over the Senkaku/Diaoyu islands and South China Sea territory, India has taken a firm stand. Thus, these discussions are considered to be of great significance. The friendly initiative between India and Japan in such constructive spirit makes them natural partners. The absence of serious disagreements like territorial disputes gives a mature depth to the bilateral relations. The growing strategic partnership is not only beneficial for the good and security of India and Japan. It also brings peace, stability and balance to the region. It is responsive to emerging opportunities and challenges in Asia-Pacific. 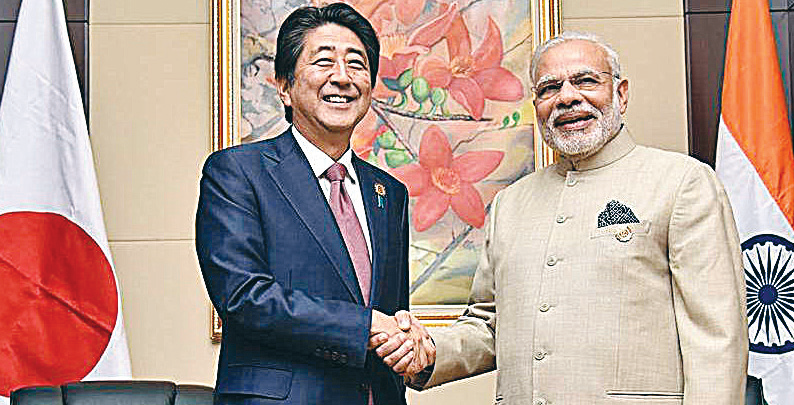 As countries with an inclusive outlook, both India and Japan have agreed to cooperate closely to promote connectivity, infrastructure and capacity-building in the regions that occupy the inter-linked waters of the Indo-Pacific. During the recent visit of Mr. Modi to Japan, Prime Minister Abe stated that he wanted to push forward with a “new Japan-India era”. On the issue of terrorism and religious radicalism, both leaders discussed the attack on a cafe in the Bangladeshi capital of Dhaka in July, in which seven Japanese and one Indian national were among twenty people killed. They have decided to work closely to boost their counter-terror cooperation including effective information sharing and capacity building. Post Bangladesh attack, Delhi and Tokyo have made serious considerations to align their positions against global terrorism. Japan's commitment in counter-terror efforts is a positive development in the fight against global menace as in the past it did not take much interest in the issue of terrorism notwithstanding Indo-Japan deliberations on the issue. In his address to business leaders, Mr. Modi pitched India as the most attractive investment destination in the world—Japan is among the top five sources of foreign direct investment in India. A significant part of Japanese capital invested in India is state-backed, providing patient capital on easy terms for long-term infrastructure projects. Private capital from Japan complements it by generating jobs in sectors like automobiles. The numbers on trade ($14.5 billion in 2015-16), however, opens up significant scope of improvement for doing justice to economic relations between the third and fourth largest economies (in terms of purchasing power parity) of the world. As has been pointed out that the present relations are based on deeper economic engagement, growth of trade, manufacturing and investment ties, focus on clean energy, partnership to secure both the nations citizens, and cooperation on infrastructure and skill development, which remain to be key priorities. The proposed Mumbai Ahmedabad High Speed Rail project with shinkansen technology, showing the target of increasing the number of visitors from the South Asian country to Japan by 10-fold from now to 1 million by 2020 remain to be one of the major initiatives in strengthening the foundation for achieving such priorities. Both India and Japan have great opportunities to bolster their bilateral relationship through a variety of political, economic and security initiatives. Both have made attempts of developing pathways of taking advantage of these opportunities. Bereft of any historical baggage Japan should abjure its inhibitions and deeply engage with India. It would be an understatement to note that the closeness that India and Japan has been more on paper and agreement than in fiscal reality. The growing closeness may be a cause of anxiety for nations in the region, which have been visible in various analysis and media reports, but in a world that has become synonymous with conflict, hatred, religious extremism, terrorism, and corruption, efforts of building bridges between nations, that binds regions together, are initiatives that will bear fruits for the forthcoming generations not only for India and Japan, but for the whole Indo-Pacific region.